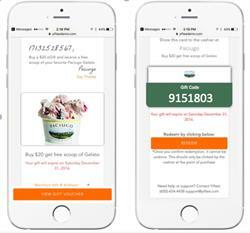 MENLO PARK, CA--(Marketwired - December 08, 2016) - Yiftee, a leading provider of data-driven mobile promotions and gifting solutions, announced today that more than 50 restaurant and retailer brands representing over 300 locations are using its platform to power eGift, interactive SMS Texting and Mobile Rewards promotions this holiday season. With Yiftee's unique digital solutions merchants can create seamless promotions that entice shoppers and drive incremental spending. Kicking off the holiday season, this year's Cyber Monday made history with a spending increase of 12.1% over last year to $3.45 Billion, according to Chain Store Age. As more people take to their phones and the web to do their shopping, it should come as no surprise that digital sales will continue to grow, with Adobe Digital Insights projecting online holiday shopping to drive $91.6 billion in sales. Bolstering this trend further are the impressive online deals that restaurants and other retailers are offering this time of year. Buy-One-Get-One (BOGO) deals for eGift Cards (the most requested holiday gift 10 years running) are plentiful during the holidays and provide excellent value for the buyer. Yiftee's platform enables restaurants and retailers to continue to build sales, engage customers and surprise and delight them with its unique digital solutions all year long. Included in Yiftee's repertoire of digital offerings are interactive email, social, print, TV, radio and billboard SMS promotions, sports and entertainment event marketing, and other promotions. Yiftee clients leverage these programs for customer acquisition, loyalty rewards, brand awareness, grand openings, new product announcements, guest recovery, holidays, limited time offers, birthday or email clubs and more. 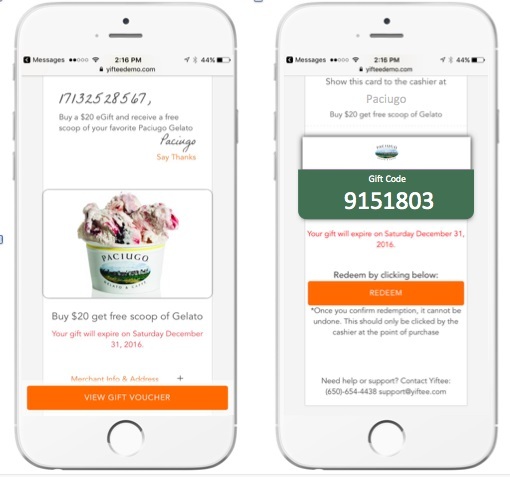 "Yiftee's mobile promotions and gifting solutions enable our clients to boost their sales while thrilling their customers year-round," says Donna Novitsky, Yiftee's CEO. She continues, "All of this is mobile, all of it is tracked, and all have customized mobile reminders which reinforce the merchants' brands. Yiftee's tracking ability is key because our analytics enable clients to review results and continually finesse their promotions." Yiftee restaurants and retailers offering holiday eGift Card promotions are below. For a full list of eGifts powered by Yiftee, please visit here. Buy-One-Get-One (BOGO) -- Many Yiftee Clients are offering bonuses to buyers when they purchase eGifts for a certain amount, such as this free scoop of ice cream from Paciugo.